Daniel G. Sánchez (1939) is the ninth Bishop President of the Apostolic Assembly. He is the first one to have been an Apostolic Assembly’s Pastor’s son. Born November 16, 1939 his father, Pastor Trinidad Sánchez, established the church in El Centro, California in the thirties. Bishop Sánchez left the Church at a young age. After marrying Evangelina Fierro on September 25, 1960 the Lord saved them when Pastor Enrique Salcido baptized them in September 24, 1961. He was soon placed in ministerial service, and pastored churches in the Imperial Valley and later in the Los Angeles area. His peers confirmed his leadership electing him Bishop of the East Los Angeles District in 1987. 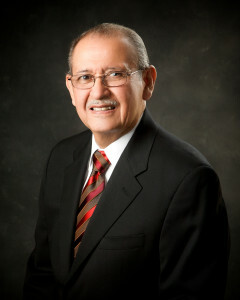 Bishop Sánchez would be elected Secretary of Social Assistance in 1990, and would later serve as General Secretary and Bishop Vice President. He organized the Nuestro Canto concert and documentary in 1994. His defining leadership, at all times founded on Apostolic history and legacy, adopted our Vision Statement (Exalt Christ, Equip the Church, and Evangelize the World), and began programs like the Strategy of Jesus and RoadMap. He has a Master of Arts (M.A.) in Religion from the Evangelical Seminary of Puerto Rico and is currently living in Anaheim , CA.